Sign up for Broadjam today to follow Buck Finley, and be notified when they upload new stuff or update their news! Buck Finley’s professional career in the music industry began at the age of nine, winning state and local competitions in Kentucky. Some 12 years later, he was discovered and his career progressed to a nationally known recording artist on well known labels. During this period, up until the mid 80s, he was produced by some of Nashville’s elite including Jerry Crutchfield, Don Tweety and Cowboy Jack Clements. After a 20 year sabbatical taking care of necessary family business, Buck has relocated to Florida and is solely working on the writing end of his talent, creating very acceptable cross-over songs. 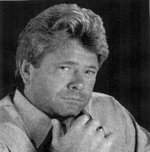 During this break, he remained connected to the industry via featured film roles, acting in music videos and co-writing music with accomplished artists such as Bobby Boyd, Shirl Milet and the late actor, Jim Varney, as well as other notable professionals in the industry.